How to create a Xp boot disk ? You are here: Home / Xp Tips and Tricks / How to create a Xp boot disk ? Creating a XP Boot Disk is quite simple. 1: Go into My Computer. 2: Have a floppy disk in your drive and then Right click on on the floppy drive and then click on Format. 3: You will be greeted with a number of options. 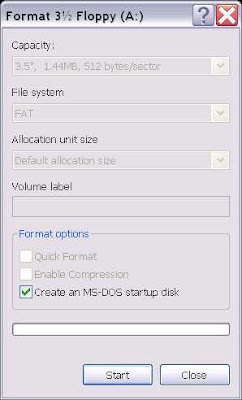 The one you need to select is “Create an MS-DOS start up disk”. Note: This requires up to 5 floppy disks.